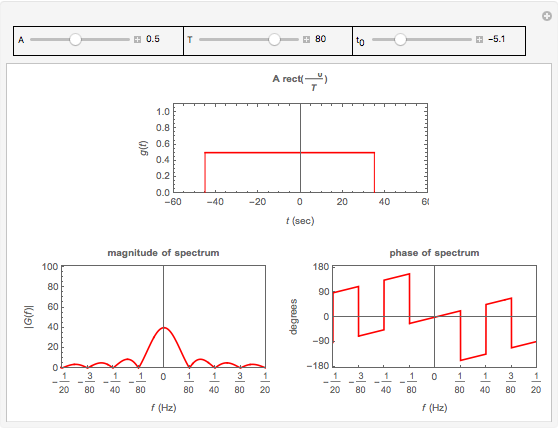 This Demonstration illustrates the relationship between a rectangular pulse signal and its Fourier transform. There are three parameters that define a rectangular pulse: its height , width in seconds, and center . 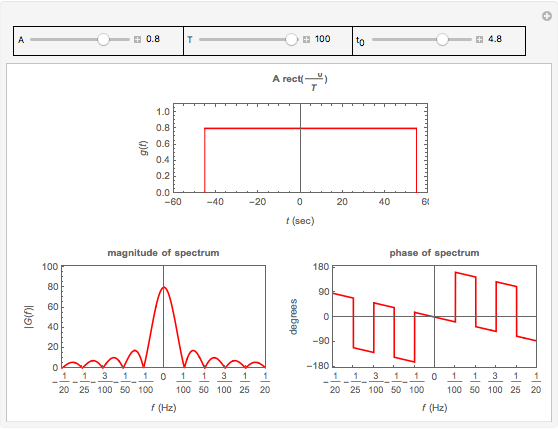 Mathematically, a rectangular pulse delayed by seconds is defined as and its Fourier transform or spectrum is defined as . This Demonstration illustrates how changing affects its spectrum. 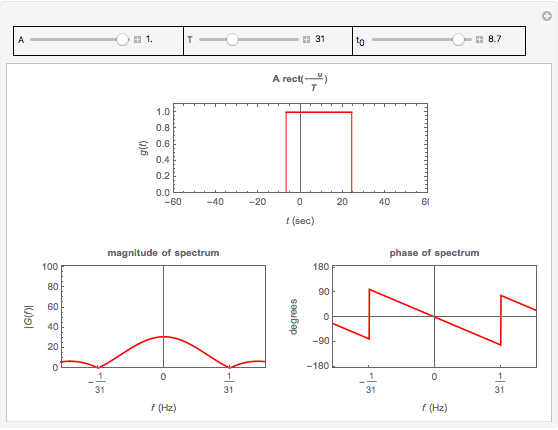 Both the magnitude and phase of the spectrum are displayed. 1. As the pulse becomes flatter (i.e., the width of the pulse increases), the magnitude spectrum loops become thinner and taller. In other words, the zeros (the crossings of the magnitude spectrum with the axis) move closer to the origin. In the limit, as becomes very large, the magnitude spectrum approaches a Dirac delta function located at the origin. 2. As the height of the pulse become larger and its width becomes smaller, it approaches a Dirac delta function and the magnitude spectrum flattens out and becomes a constant of magnitude 1 in the limit. 3. As changes, the pulse shifts in time, the magnitude spectrum does not change, but the phase spectrum does. 4. We notice a phase shift at each frequency defined by , where is an integer other than zero, and is the pulse duration. These frequencies are the zeros of the magnitude spectrum. Nasser M. Abbasi "Rectangular Pulse and Its Fourier Transform"